Dr. Sharmini Jayamaha and her husband Don, of Mattituck, often purchase milk and eggs for their family from a humane farm in Riverhead. On a recent visit, they saw a sign at the farm advertising veal for sale. The farmer, whom they’ve grown to know and respect, brought them to see four baby cows, just three months old, who were due to be slaughtered on March 22. Because dairy cows need to have babies in order to produce milk, the farmer explained to them that the meat from the babies was ultimately a byproduct of the dairy farming process. 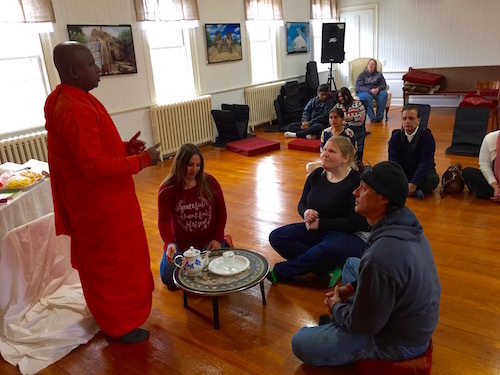 The Jayamahas are very involved with the Long Island Buddhist Meditation Center, which recently moved from Port Jefferson to the old Grange Hall on Sound Avenue in Northville. They negotiated to have the cows’ lives spared, and then got together with their friends and colleagues from the meditation center to help find them a forever home, at the Indraloka Animal Sanctuary near Scranton, Pennsylvania. 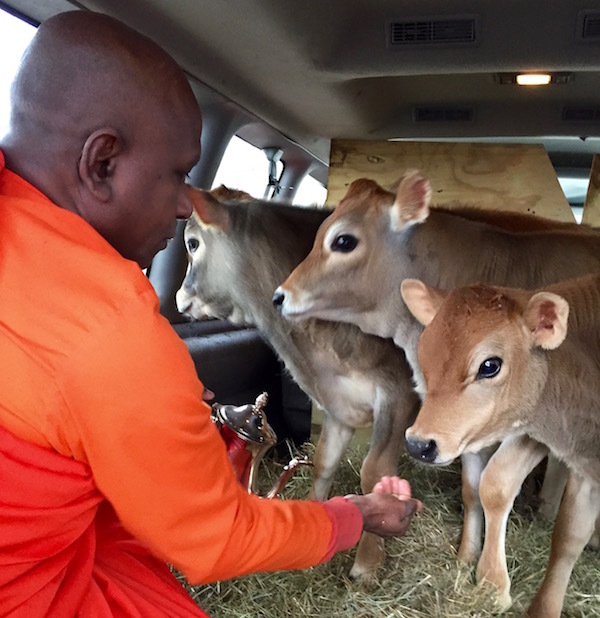 On the Sunday morning of March 25, after a blessing by Chief Monk Bhante Kottawa Nanda in the parking lot of the meditation center, the calves began their four-hour journey to their new home. The sparing of animals’ lives in honor of departed loved ones or for milestones such as birthdays is a common practice in Sri Lankan Buddhism, said Mr. Nanda. The rescue of the calves was a personal matter for Mr. Jayamaha, who had initially decided he wanted to save one calf, in memory of his mother, Rachel, who recently passed away. 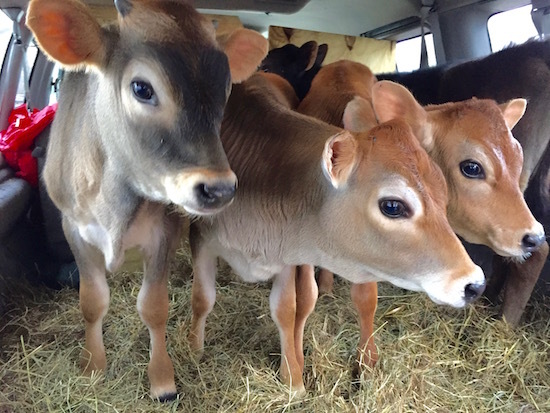 He named the first calf Rachel, but then, as support from his colleagues at the meditation center grew, the group ended up adopting all four calves, paying $5,000 toward their care at the sanctuary. The second would be named Lakshman, after Mr. Jayamaha’s middle name. The third would be named Dhiraj, an amalgamation of the first names of Dr. Dhiren Mehta and Dr. Rajesh Patel of Riverhead. The fourth would be named Nanda, after their chief monk and after another active member of the center who bears the same name. 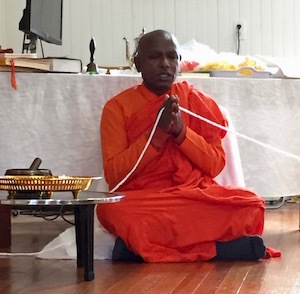 Venerable Bhante Kottawa Nanda leads the group in prayer. Mr. Nanda acknowledged later that this act is just a small one when it comes to the suffering of animals who are scheduled to be eaten by humans. Indra Lahiri, who founded the Indraloka Animal Sanctuary in 2005, was raised a Hindu, and while the animal sanctuary is home to animals of all species, cows have held a special place in her heart. She told the visitors at breakfast of the best friend she’d ever had, a cow named Penny who lived to be 30 years old at the sanctuary. Saved from slaughter after a life as a dairy cow in which she gave birth to many calves who were slaughtered in front of her, she took on a role at the sanctuary nurturing all the other animals there. Shortly after Penny’s death, Ms. Lahiri received a letter from a woman named Sue, who had been grieving since she lost her four-year-old child and had visited the sanctuary after hearing about Penny. She found the elderly cow, and sat down in the pasture with her and cried, while Penny put her head on Sue’s chest and also cried. From that day forward, said Sue, she felt free from the grief and was able to appreciate the beauty of her own child’s short life. Ms. Lahiri said most of her trips to pick up animals being rescued are bleak ones, in which the sanctuary is called in after farms have been shut down for animal cruelty. This trip, however, was nothing like that. The group isn’t naming the farmer involved because he had done nothing wrong and had been very helpful with the process of finding a home for the calves. Ms. Lahiri said criticism of the farmer wouldn’t help the animals in their future lives. After breakfast, Mr. Nanda led the group in a prayer in the upstairs meeting hall, which had previously been used for generations by farmers at the Grange to discuss their livestock and crops. Mr. Jayamaha tied a white thread to a statue of the Buddha on the stage at the front of the room, which he then threaded through the hands of everyone in the room. Ms. Lahiria, along with her assistants, Johnny Braz and Sarah Thornton, then helped the monk bless the holy water that would be used to bless the calves before their long ride to Scranton. Mr. Nanda said this isn’t the first time the Long Island Buddhist Meditation Center has spared the lives of animals, but these are by far the largest animals they’ve spared. In the past, they’ve spared feeder crickets and fish, and rabbits. He’s thinking next of sparing lobsters on the last day of lobster season, so that even if they are caught again, they will be able to live peaceful lives until the season reopens. Donations to help care for the calves can be made at www.indraloka.org. For more information on the Long Island Buddhist Meditation Center, which holds free community meditation sessions on Tuesdays and Fridays at 7 p.m., visit libmc.org. The calves just before departing to their new home. Indeed a great spiritual journey for us seeing these lovely little calves get a permanent safe home at Indraloka Sanctuary. 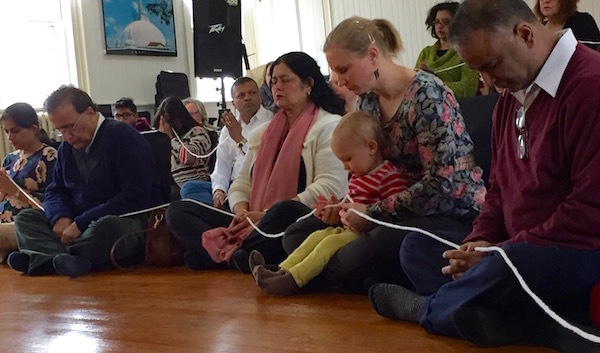 Along with the LI Buddhist Center, we all at the INELI ( Indian Network of Eastern Long Island) feel extremely proud and blessed to be a part of this amazing process. Thank you for offering this insight. I too would love for the kind gentle religion of Buddhism, to see the pain and suffering in dairy. Four lives were saved today, but the money the farmer was paid with, will be used to aid the dairy business by using cows as food and biproducts. Why do we continue to harm, when the least amount of suffering is through utilizing no animal? Veganism is compassion. I am crying. This is so beautiful!! Thank you for bringing us this story. So thrilled to know this is happening in our midst. Happy Easter. Happy Easter, Vicky! Thank you.